At least I hope they are! Several years ago I found a recipe for making green chile sauce in the newspaper. Particularly Hatch green chile sauce. I saved the clipping for years. Then my good friend and neighbor, Linda, saw that Whole Foods had them and roasted them as well. This was a few years ago and now we eagerly look forward to purchasing them each year. Last year we waited too long, and while we were able to purchase them, the roaster had moved on and we had to do it ourselves. I will tell you that with my small, unevenly heating grill, and my broiler in the oven, I was able to roast almost an entire box! Let me just say we won’t be making that mistake again! The small amount charged for roasting is totally worth the hours I spent doing it myself. For those of you who don’t know Hatch green chiles come from Hatch, New Mexico. From the little I know, it seems that the growing conditions are excellent in that area and so the chiles are superb. I can attest to that fact! Usually they arrive in August and are around part of September as well. Be sure to watch for them. The first year Linda and I purchased them we decided to make use of my yellowed newspaper recipe. 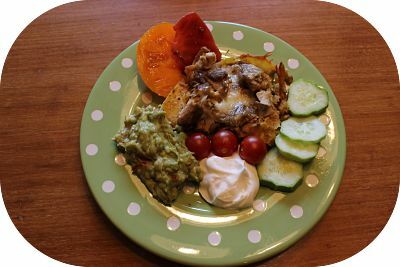 It turned out delicious and made for a very quick chicken enchilada dinner, if I had precooked diced chicken in the freezer. My friend Tish created a simple enchilada recipe for me in order to use up that sauce, and that’s the one I’ve used since then. I have another one that is outstanding but requires lots of prep. I’ve decided it isn’t worth it to spend that much time in the kitchen. To make the enchiladas I oil whatever size dish I need. Next add a little sauce to cover the bottom. Tear corn tortillas into smaller pieces and place a layer on top of the sauce. Layer torn or shredded chicken. Sauce is next, followed by a sprinkling of cheddar cheese. Repeat one or two more times ending with cheese. Bake at 350 until bubbly. If the cheese starts to get too browned, place a sheet of foil over the top until baking is complete. Or place the foil on at the beginning and remove five minutes or so before done. Serve with guacamole, sour cream, salsa, and whatever else you like. This truly is a quick and easy dish. It’s a little hot during the summer but worth the ease of preparation if feeding guests. Here’s a tip for storing. I freeze some whole on a cookie sheet and bag in a freezer storage bag in order to pull out one or two at a time. These I use for scrambled eggs (the very best! ), burgers, sandwiches, etc. Others I bag with 40 in each in order to make the sauce. Here is the recipe for the sauce. I’m using the small batch proportions but I’m fairly certain you’ll wish for the big batch after tasting it! To do that increase chiles to 40, 2 sweet onions, 1/2 head of garlic, 2 grated carrots, 8 cups stock, 2 T salt, 1/2 T black pepper, 1/4 c oil. My suggestion is to use homemade stock, but if you choose not to, the salt amount may need to be decreased. Enjoy! And please share how you use green chiles! Add garlic, carrots, sauté another 2 minutes. Add stock, seasonings and bring to boil. Lower heat and simmer 30 minutes. Blend using immersion blender and simmer up to 3 more hours if desired. What’s the Gut Got to Do With It? Beans – Prepare Them Properly! Amy on Yikes! What is THAT! Robin on Yikes! What is THAT!